Thank you all so much for the well wishes, I am FINALLY feeling a lot better (of course because the weekend is over). Mondays can be tough. Today's was mainly hot. Really hot. Like 117 degrees hot. The pool was an un-refreshing 88 degrees. I'm seriously considering buying a bunch of huge blocks of ice and throwing them in there. One good thing about Monday? 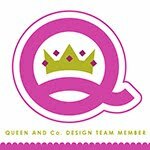 The new ScrapTiffany blog challenge is up. 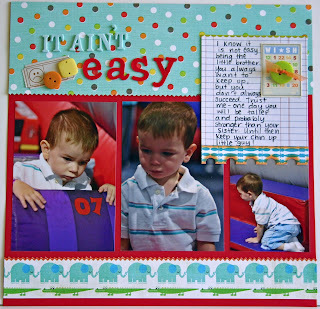 The challenge this week is to use a recycled item on your layout. Manufacturers are making it easy to use their packaging on layouts these days. Often the cards that flowers or brads are attached to have lines that are perfectly for journaling. Mine was a packaging of Sassafras flowers. And every Jenni Bowlin package of Bingo cards has a a card on the back that shows you what images are included in the pack. I always cut it up and use these mini cards too! So here is my recycled packaging layout. Be sure to go over to the ScrapTiffany blog and check out the other amazing layouts and Tiffany's awesome mini book. And if you take the challenge be sure to send a photo or scan to Tiffany HERE to be entered into the monthly drawing for a free kit. I have one more quick share. I made a simple card from my Create My Keepsake July kit. Both the Making Memories cork letters and October Afternoon Cherry Hill sticker sheet come with TONS of letters. I won't run out any time soon! 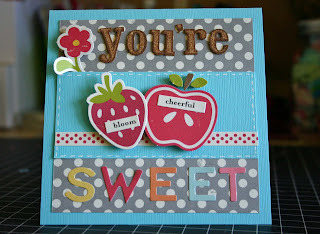 And the October Afternoon die cuts and stickers are perfect for cards. Those are so cute, Rebecca! I love to use packaging too...they have such neat ones these days. Have a great day! too too cute Rebecca. I love your layout and card. I was the baby of the family too so I can relate to your little guy! And I did outgrow my sister by 7 inches! ha! Have a great day! 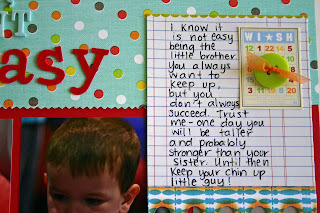 Fabulous layout and card Rebecca! Great page and card! It's always an added bonus to be able to re-use the packaging, etc in a fun way... Gotta luv that! Love your layout Rebecca! And the card is so cute. Glad you are feeling better! Loved your layout. 117? Really. That is just crazy!